: It's like a huge tomb. 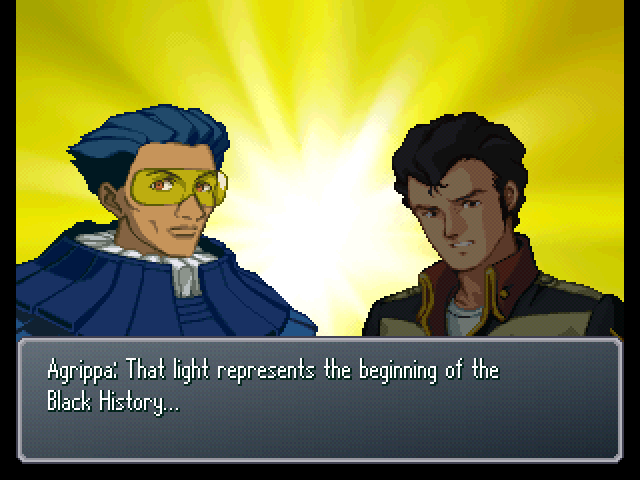 : This is where the history of humanity's sins is buried. : A truce, for now. After all, you've also demonstrated the qualifications to reach D.O.M.E. But don't forget that her royal Highness is in my care. : Got it? Try anything funny, and the queen is toast! : You! You would dare to take Lady Diana's life!? : Ahahaha, bingo! There's another one, so it's no big deal if one dies, right? : That's the idea, Harry Ord. The royal lapdog should step back and behave. : Who knows? 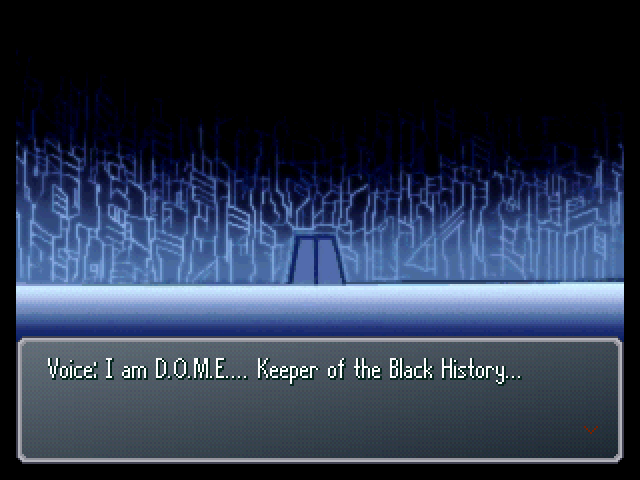 It looks like D.O.M.E. 's led her off somewhere. 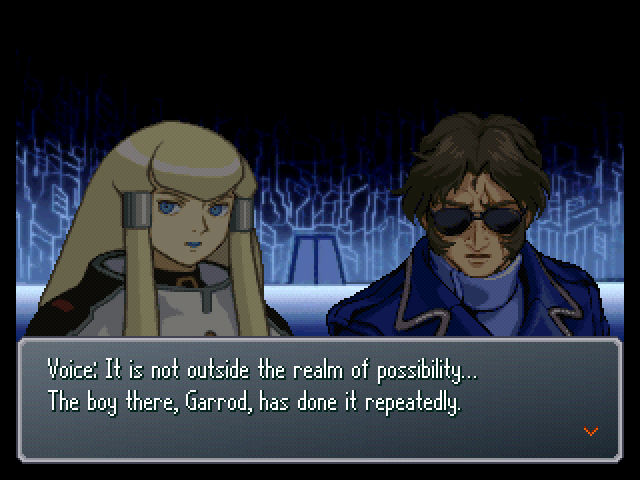 : Calm down, Garrod. Remember what I told you? : I can't do that. I'm under orders to apprehend intruders. : Hoh... So you've come to join us? : ...So he's like Kashim King of the Innocent. 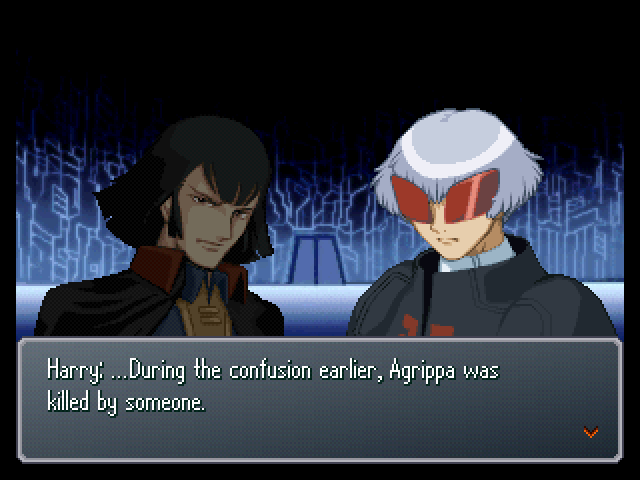 : What did you come here to do, Agrippa? Cowards who fear fights should stay in their palaces, huddled up and cowering. : The Black History must not be revealed to savages who don't even comprehend the Turn-A and Turn X's meaning! 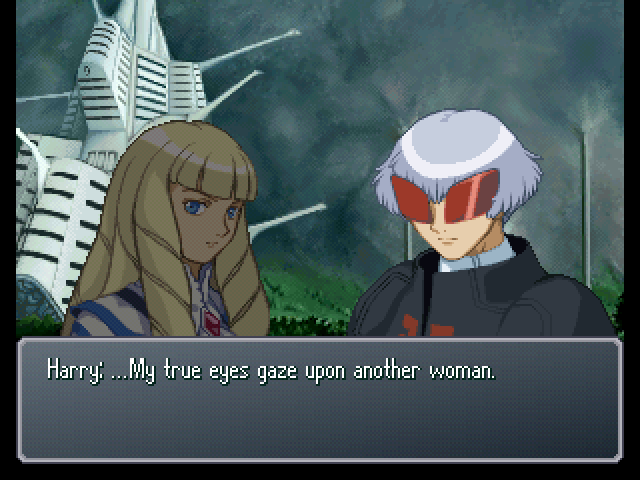 : I see... So you came to erase the Black History data. : All prior history was resolved by the Turn-A and Turn X. That is all that matters. They're all relics of the past...! There is no need for ignorant Earthnoids to learn of that! : Consider why it is that ancient history has become referred to as the Black History. : This isn't something that's okay to learn! Learning of it can lead to utter chaos! : Look! There are images on the ceiling and walls! : What's that giant pipe!? 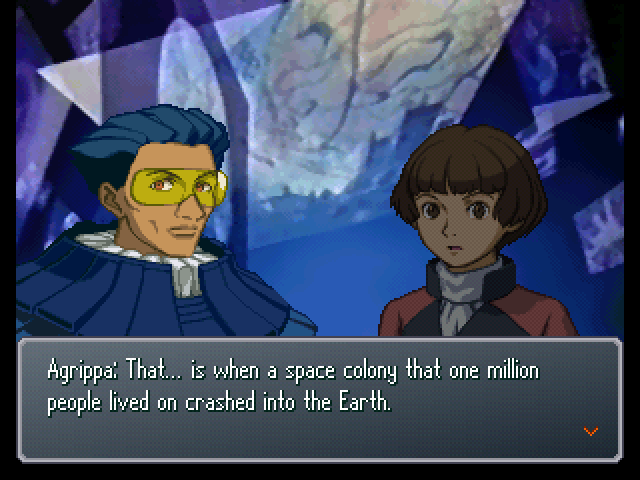 : A space colony...? 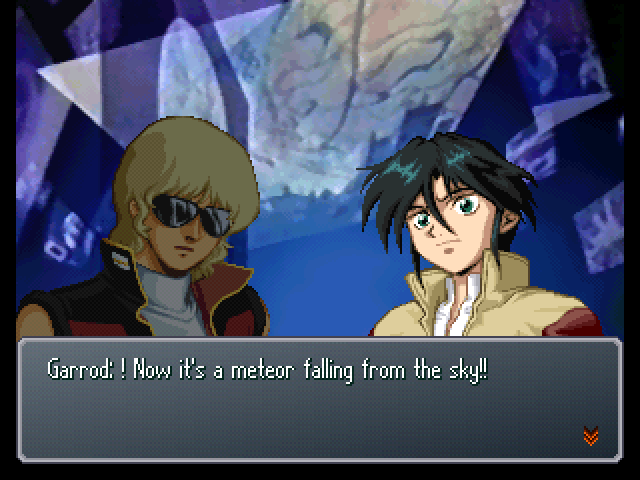 Crashing into the Earth...? It's just a movie, isn't it!? : Correct. This is ancient history... Records of the Space Era. : They're a little different. They look all old and stuff. 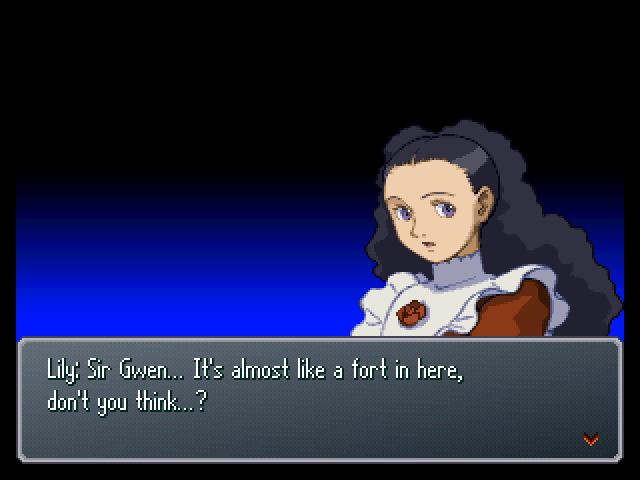 : Hoh... the Borjarnon sure gets around. : The scene over here... 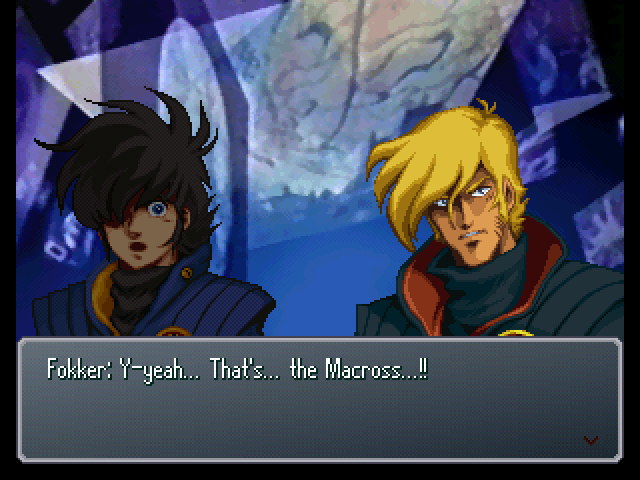 There's Mazinger Z...! 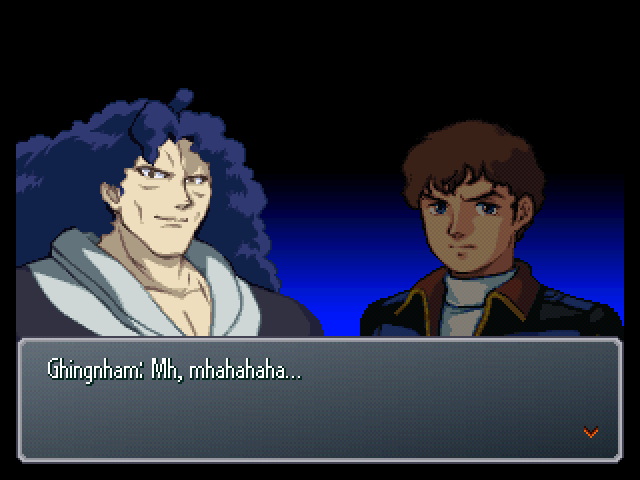 : Ryouma's group's Getter Robo, too...! : Wh-why...? Why's it showing everyone's mechanical dolls!? : The war with that deplorable name went on to consume even those in outer space... It drove the Earth to the brink of extinction. : A swirl of light...! 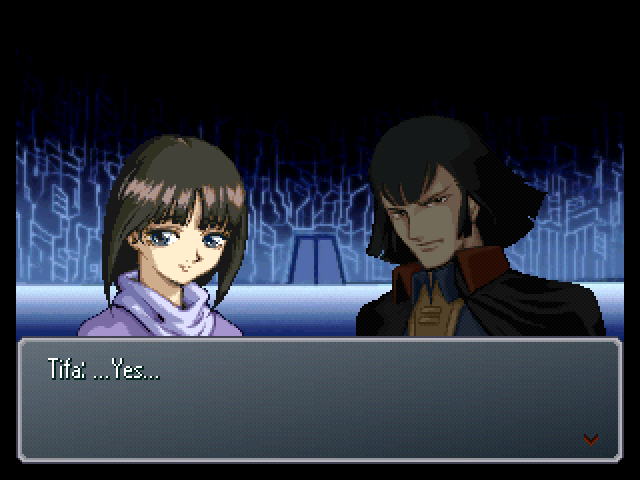 : Yes, it's the result of the foolish choice all of you made at the end of the battle. Those of the Space Era tried to devise a plan to defend the Earth from the giant shockwave... But it was never completed, and as a result, the Earth's environment underwent drastic changes. : And the only ones to survive that great disaster... 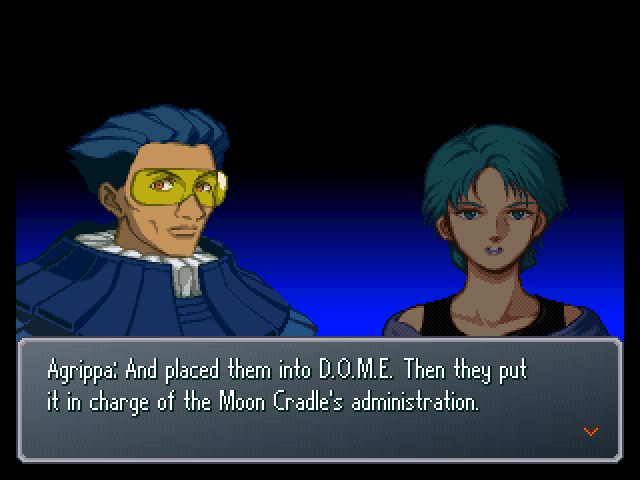 Were our forefathers, who went to sleep in the Moon Cradle's artificial hibernation facility. : So Man's history really is suffused with battle. Man can never give up fighting. 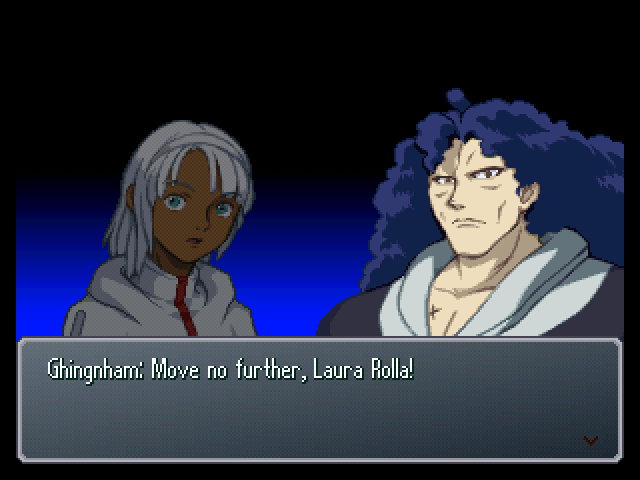 Agrippa, Diana... The path you showed the Moon Race was the wrong one. : The Sorrel and Maintainer house's millennia of peace were just a pipe dream... It was nothing more than artificial repression of Man's basic combat instincts! : Fighting is how we evolve. With you repressing that, the Moon Race will regress... Into a race of weaklings who can only keep hibernating! : Please. The Innocent's Humanity Restoration Project is nothing more than empty folly fostered by a group of savages. On the other hand, our forefathers made an excellent administrator to guide Man towards peace. : A system that houses them!? 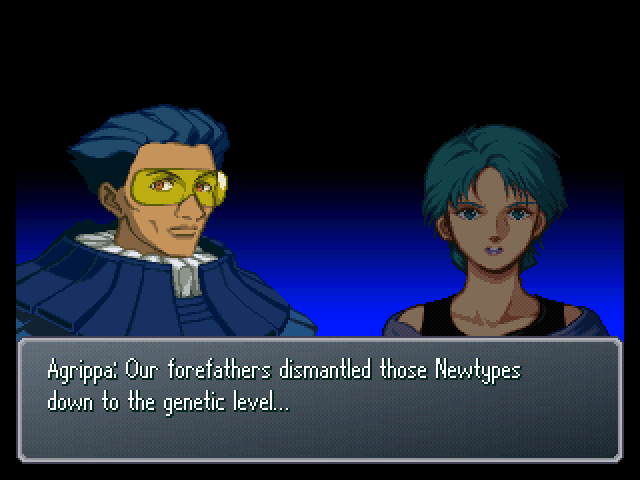 : They dismantled Newtypes... down to the genetic level...!? : (.........) I've come this far in search of what we really are. I haven't found my answer yet. But I can say this much. 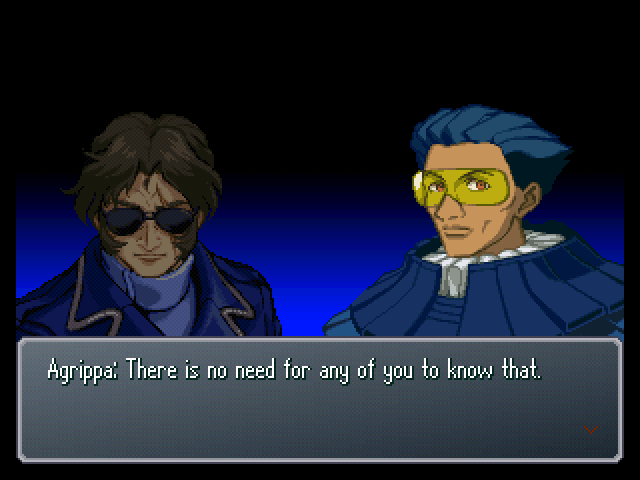 Newtypes are not gods! Neither are they tools of warfare! 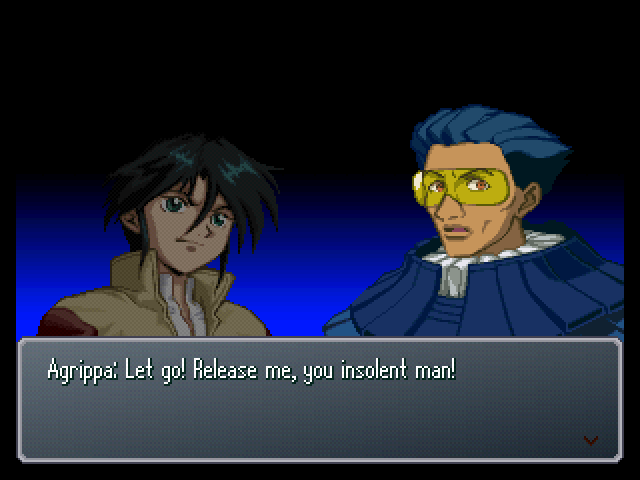 To steal a Newtype's life, to make someone into that... No one has that right! : But D.O.M.E. is the whole reason the Moon Race has lived this long. 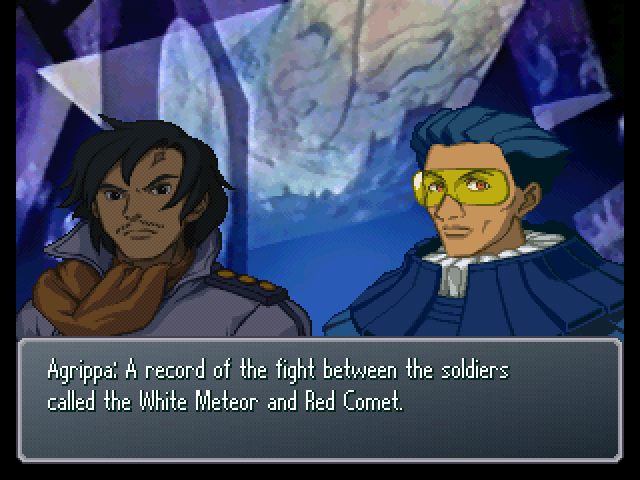 : According to records, Newtypes were also a race which excelled in combat. And our forefathers added the capability for D.O.M.E. to act as a defensive system. : That was in order to protect the solar generator, the moon's lifeline... From those such as Gym Ghingnham who are ruled by combat instincts, was it not? 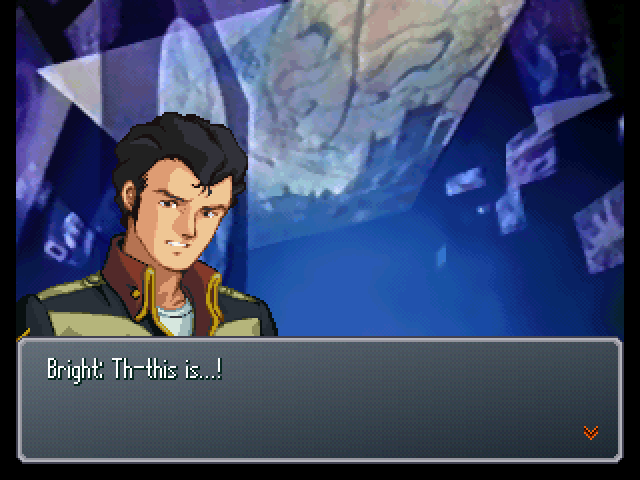 : You mean the GX that had the Satellite Cannon!? : Th-then... 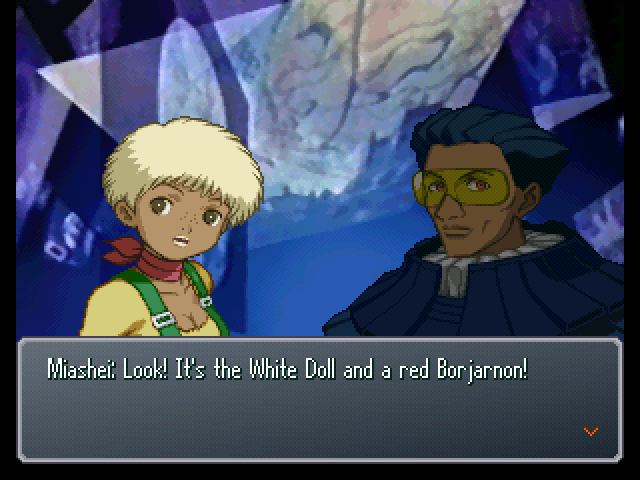 Exactly what are the White Doll and the Turn X!? 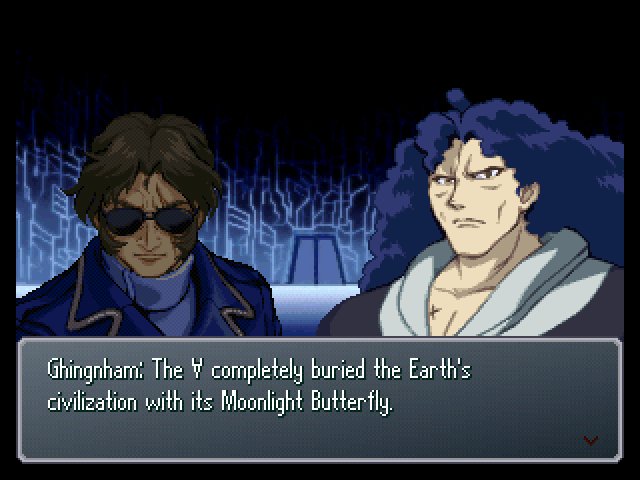 : And what does the phrase 'Moonlight Butterfly' mean...!? : What matters most is that the Turn-A must be sealed away by the Turn X. 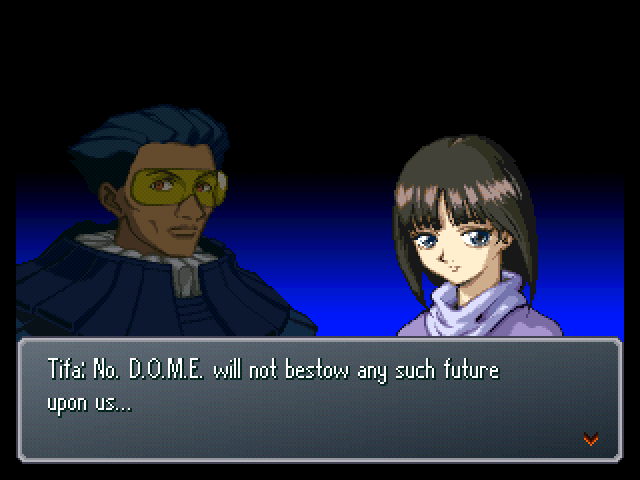 You all can simply live amid the peace that D.O.M.E. maintains. : Though of course, now that you've learned the truth of the Black History, I can't let you leave here. : Have you forgotten? This is the Moon Cradle... Another winter palace. : That is the future that you've all been given. I hope you enjoy it. 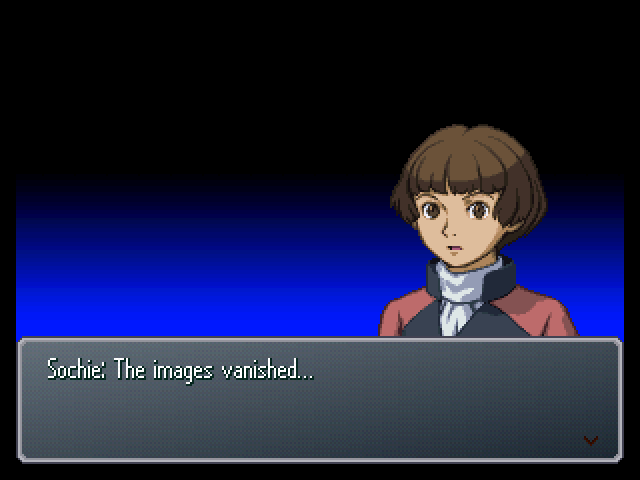 : I-impossible...! 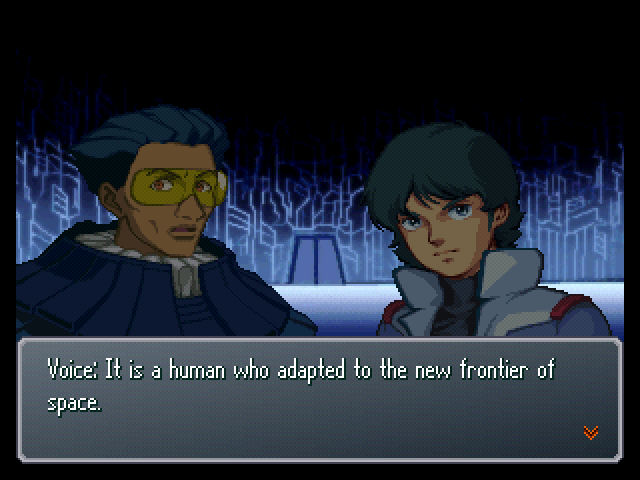 Does this mean the personality of the Newtypes inserted into the system has returned!? Th-that can't happen! Any personality should have been erased ages ago! : D.O.M.E.! 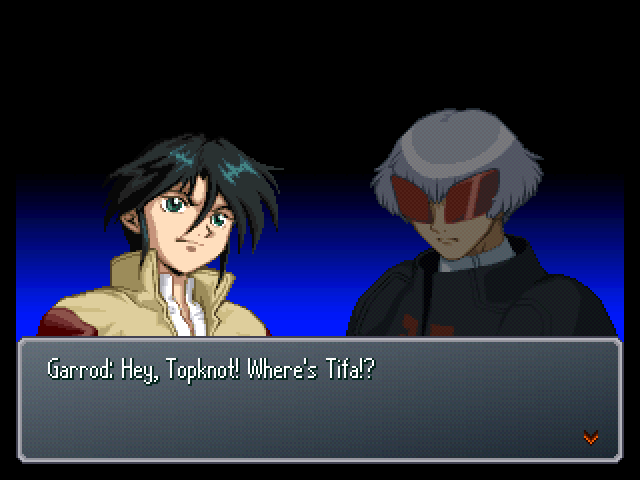 What did you call Tifa here for? : Yes... The history of mankind was a history of repeated battles. 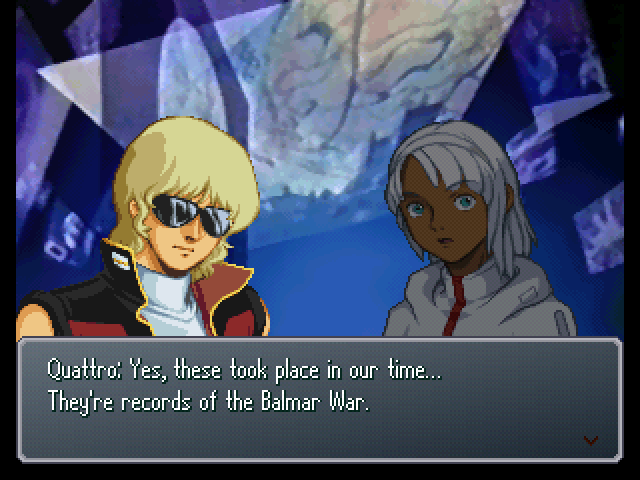 And one of the things which emerged from that was the concept of Newtypes. : But perhaps, in a sense, that was meant to be. 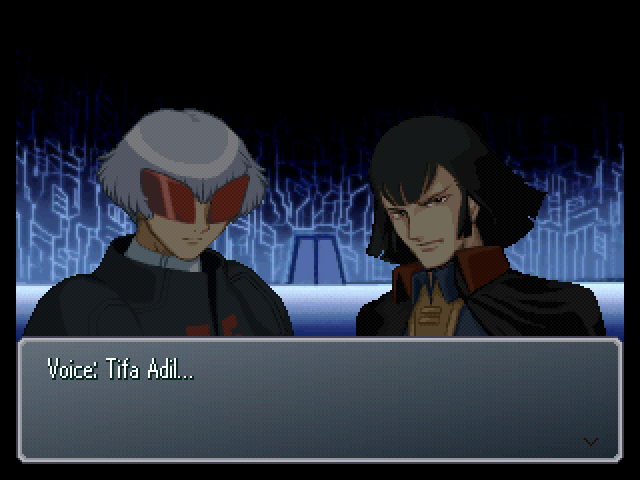 : D-did you just call Newtypes an illusion!? Then, your power...! If you define yourself as an illusion, how do you explain a machine with its own will!? : That is due to the power within me. 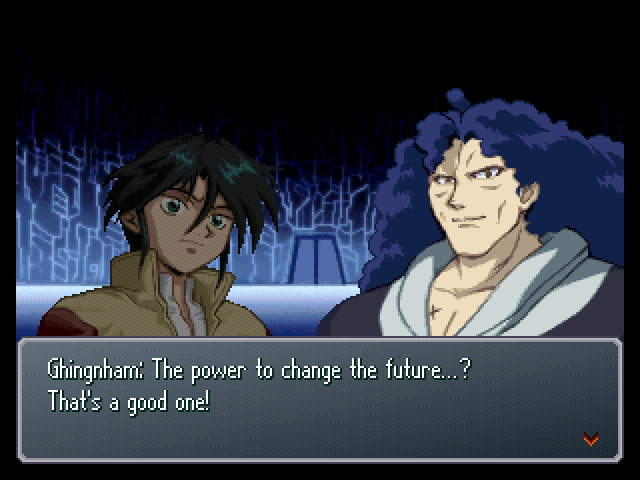 : Is that power not the power labelled as human progress... as a Newtype? : I was a being with power beyond that of a human... not a Newtype. : But my power became a new standard for people who had lost their way. That was the phrase, 'Newtype'. 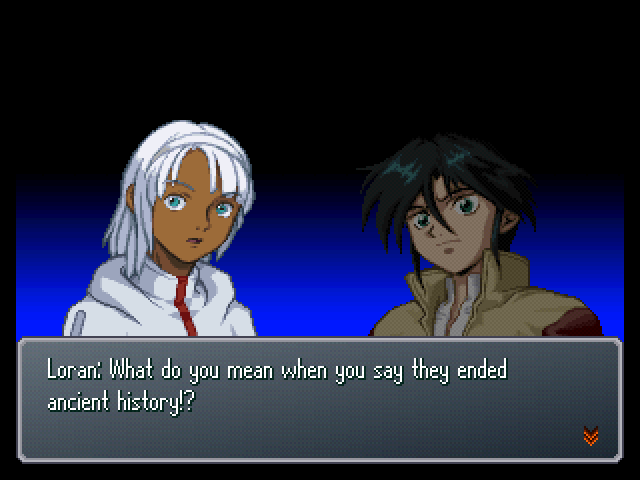 With me gone, the phrase 'Newtype' should have vanished as well. But people like the Maintainer house were captivated by the notion, and sought to expand upon it. : What are you saying! 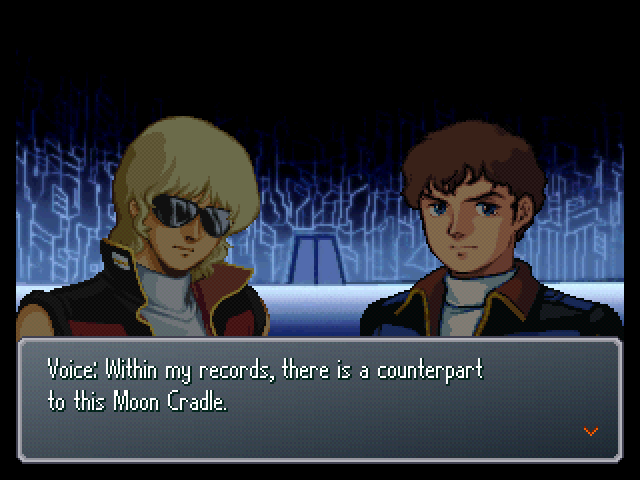 Newtype power is what leads our Moon Race! : That, too, is nothing more than an illusion. : As long as you remain trapped by that notion, the Moon Race will have no future. 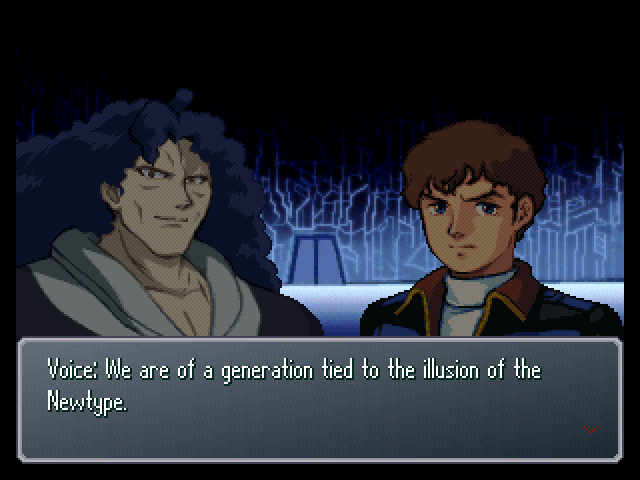 : Then what do you claim a Newtype is!? : Then, are you one of the Pychics or Psychodrivers who existed in our time? : Then, tell me this. I was a boy back then. 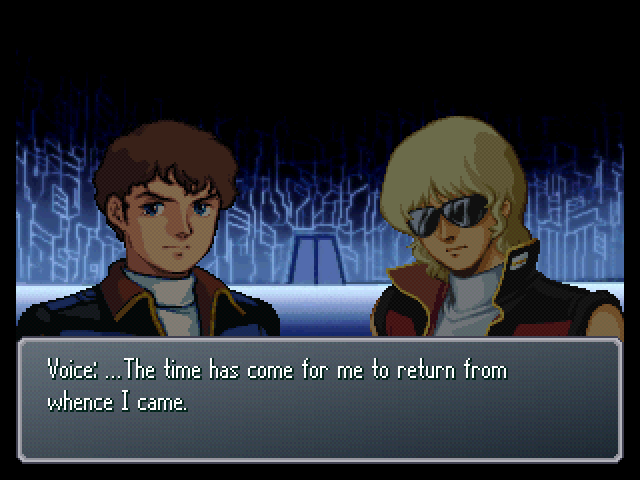 I fought, believing that I was a Newtype. 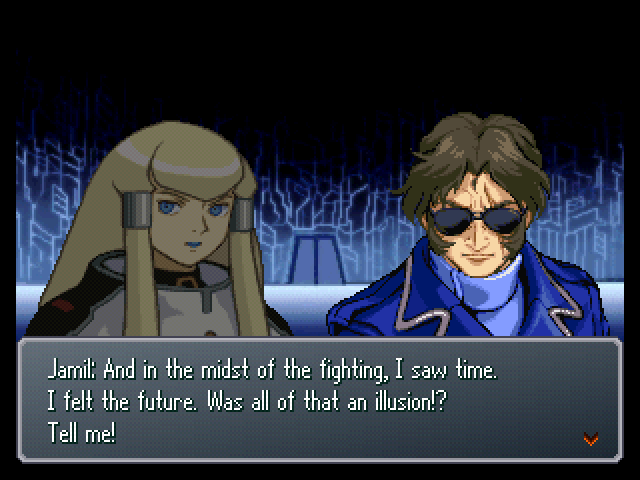 : Yes, it was all an illusion. No matter what kind of future you see... Whether you try to act for it, or against it, it remains out of your grasp. 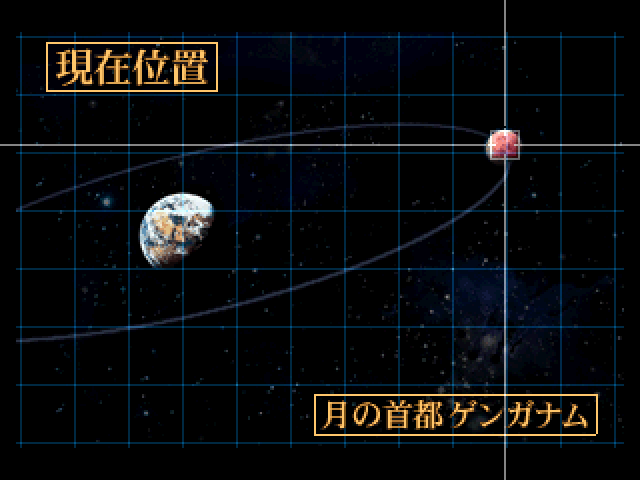 : The time of wandering in search of Newtypes... And the time of clinging to the illusion of the Newtype... Both have ended now. You all must make a new future, with your own hands. : Make a new future...? : You've changed every vision of the future that Tifa has had. : The White Doll buried... civilization!? : Whatever history you all make, or future you change, will be pitiful. : Yes. Like our forefathers, the Turn-A scattered nanomachines across the Earth's surface. But the defining difference between them is their goals! 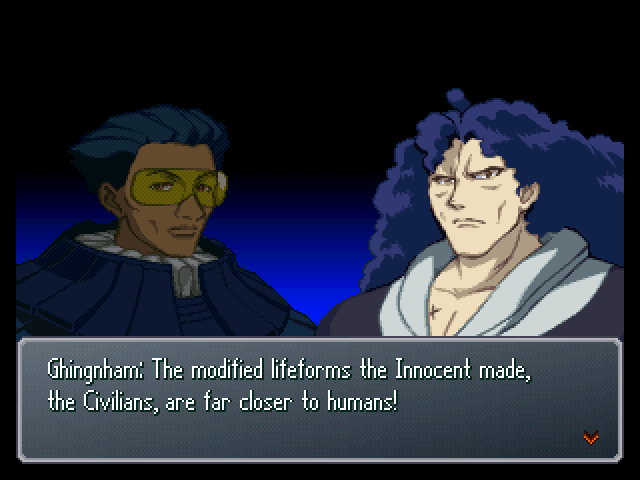 We sought to use nanomachines to restore the Earth's environment... 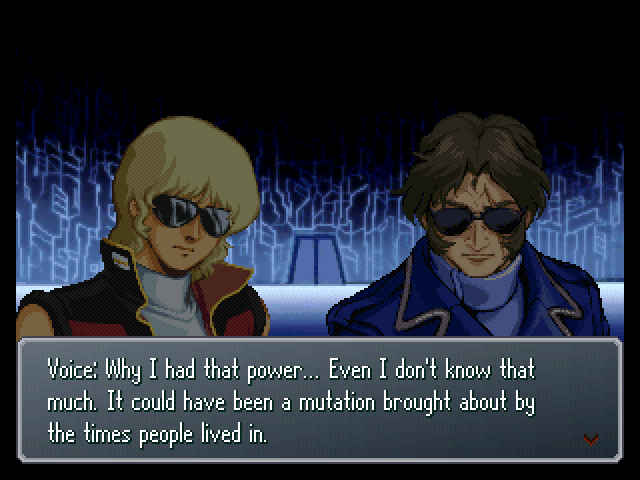 While the Turn-A's nanomachines reduced the Earth's civilization to dust, and buried it in the ground. : So that's the secret power the White Doll holds! : And once it finished its mission, the Turn-A voluntarily buried itself inside a Mountain Cycle. : The Turn-A... So that's the kind of machine it was...! 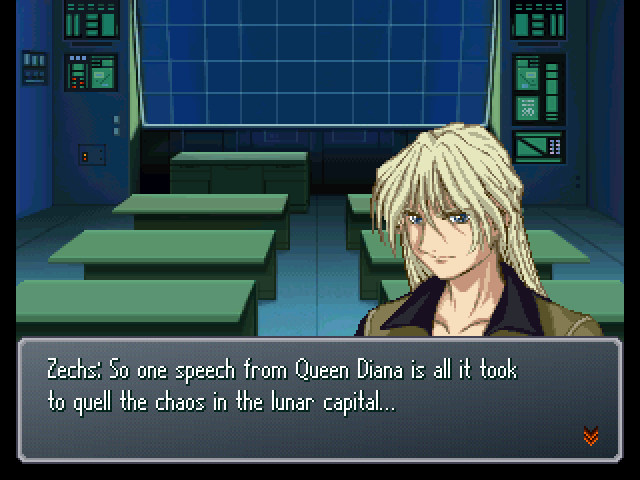 : (.........) As the moon's sovereign, I, Diana Sorrel, order Agrippa Maintainer and Gym Ghingnham. Withdraw your armies immediately. ...And cease using your spies in the Diana Counter to sow unrest down on Earth. : Then the Diana Counter will be dismantled. : We can dismantle the Diana Counter in both your name and mine. : Will the ones who made Earthfall heed that order...? 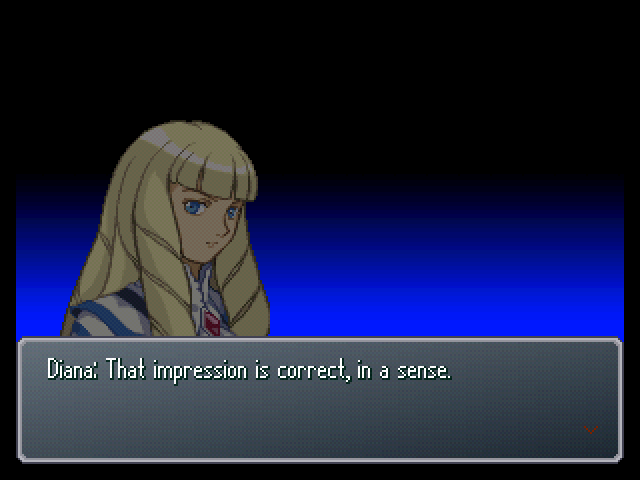 : That's how people get, once their combat instincts have been sparked. I wanted the Moon Race to live forever in peace, never knowing the truth of the Black History. 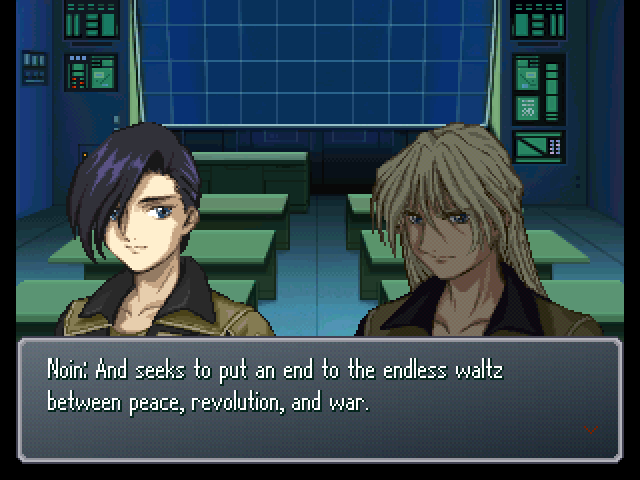 But, those who have had their combat instincts awakened must be removed from the moon. 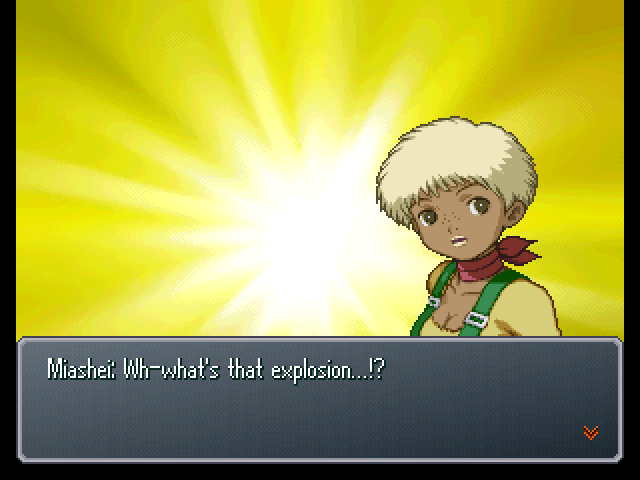 Suddenly, an explosion shakes the entire Moon Cradle! : Is someone attacking D.O.M.E.!? : It must be Swesson. Marybell, we're pulling out! : Eh!? 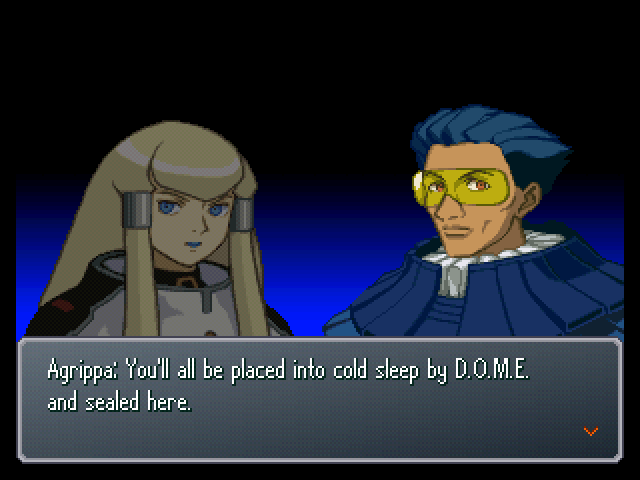 What about D.O.M.E.!? : If it is truly a machine with sentience, it won't do as I say. In which case, I have no further use for this place. 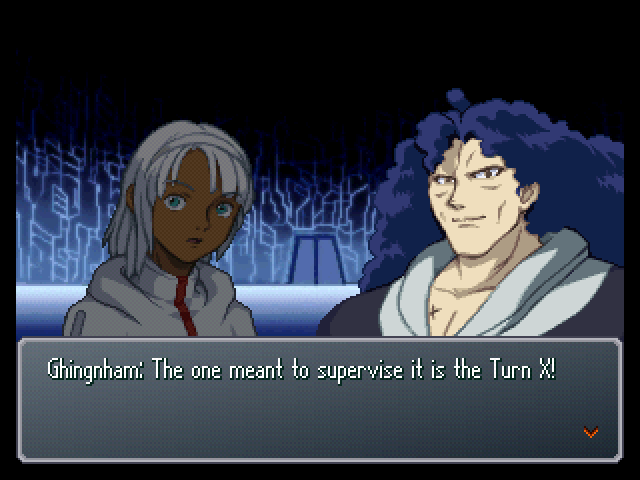 Besides, we have the Turn X for power. : What about Diana and Tifa? : Ahahahaha! That's the way to do it! 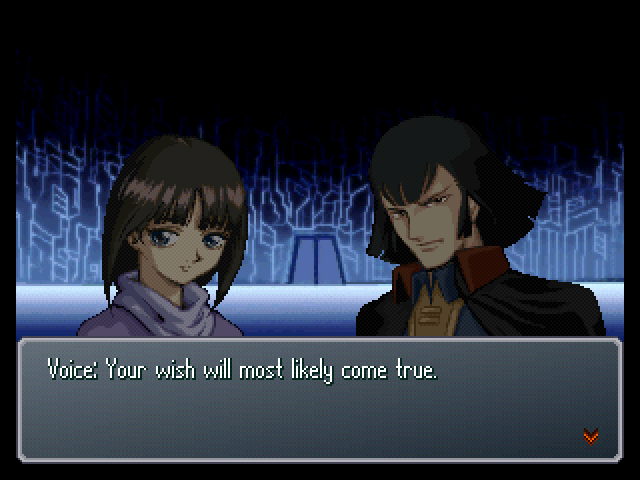 : Oh no, Lady Diana and Tifa!! 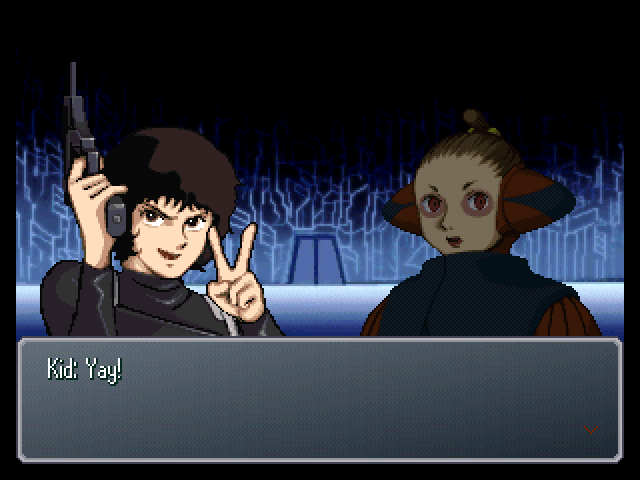 Someone shoots the gun out of Marybell's hand! : ! Who was that!? Who fired a gun!? : You've got a lot of nerve! : It amazes me you can do that with such a cute face. : I've been waiting for a chance like that to come up. : It's not like we skipped out on all the action. Please don't get the wrong idea about that. : Heheheh... saving a VIP could net us an extra bonus later. : Hey, Poncho. Don't talk like that. You're making us all look bad. : Yeah, yeah! It's a man's duty to save the chicks. : Hmph...! Irregulars... We shall settle this on Earth! : Hold it right there!! : Don't chase him, Kid. Ensuring Queen Diana and Tifa's safety takes top priority right now. 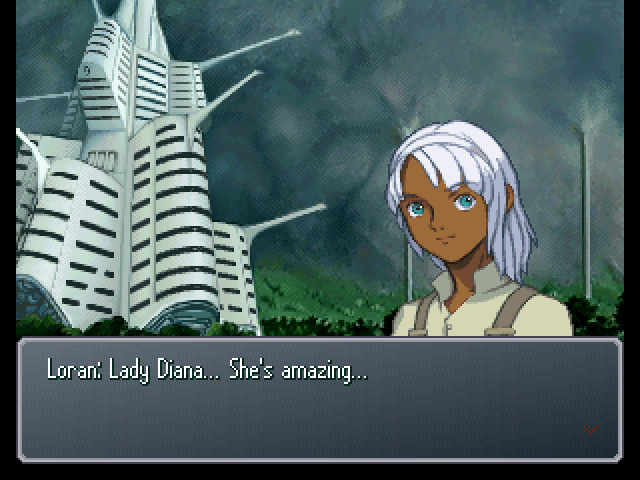 : Are you unhurt, Lady Diana!? : Yes... I'm fine, Harry. : He's trying to flee the Moon Cradle and head for Earth. Wait, do I hear a snake!? Kid quickly shoots the snake. : Phew! That was close... There was a cobra there. : Still, what would a cobra be doing here...? : M-Master Isaac! There's trouble!! : ......! This has his fingerprints all over it...! This is Khamen Khamen's doing...! 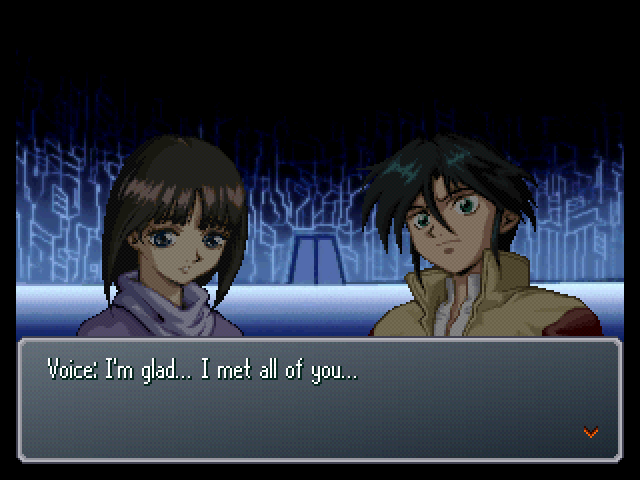 : When you met Garrod, that was the first time you sought your power, right? You wanted to become strong, right? : Do you recognize your own power, even now? : (.........) D.O.M.E.... You have my gratitude for protecting us all this time. : There is no need to feel guilt over past deeds... That truth, at this point, is nothing but a mere page in our history. 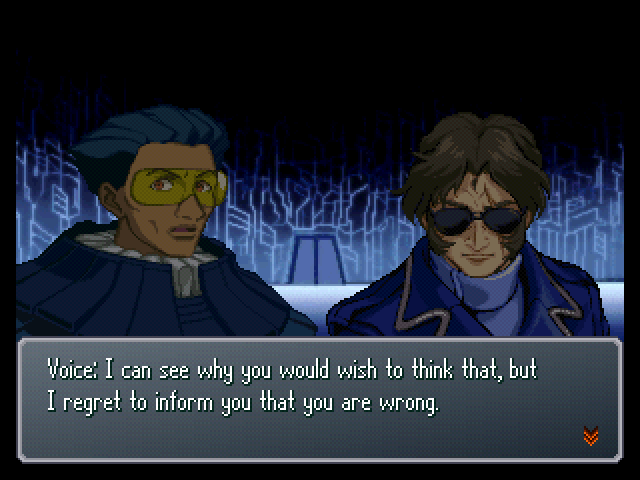 : Then, for what reason were we transported here? : (.........) That, I do not know. All I can tell you is... It was probably inevitable for you all to come to this time. : A counterpart... You mean! 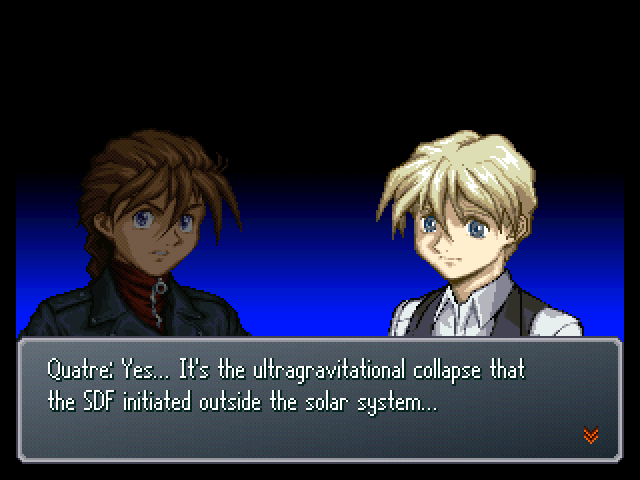 : You mean the Earth Cradle? : The two cradles were built before I was born... so I know very few details about the Earth Cradle. But... If you could reach that other cradle... You may find the answers to your questions. : H-hey! What do you mean, the place you came from!? : I deeply regret the circumstances that cause you unrest. All of the responsibility for it rests with me. 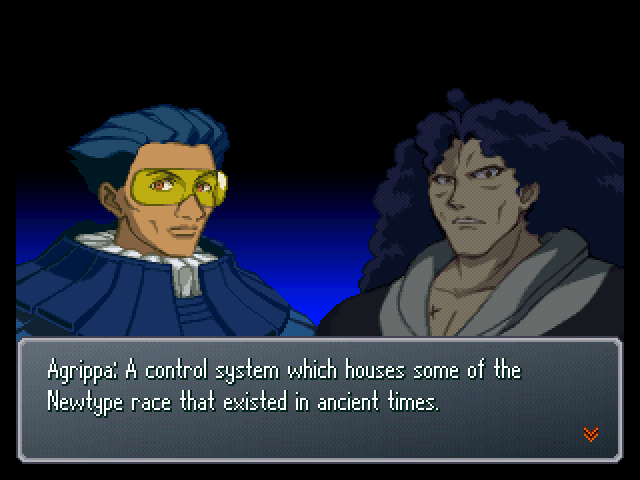 But I wanted you all to know that our Moon Race is a race revived from ancient history. 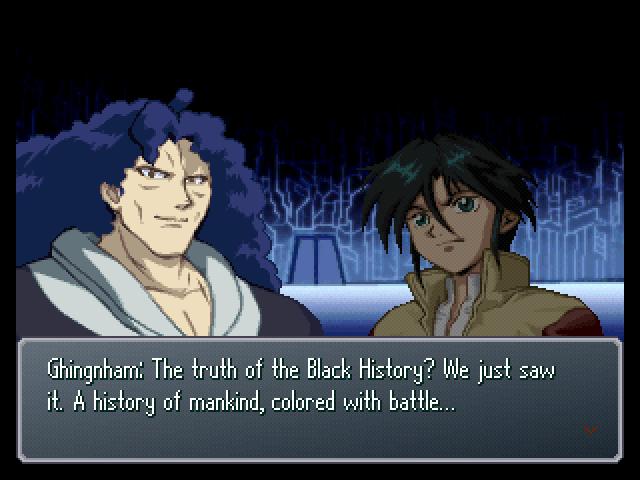 For that reason, I spread the Black History's data throughout Genghnam. : This should settle matters on the moon nice and neatly. 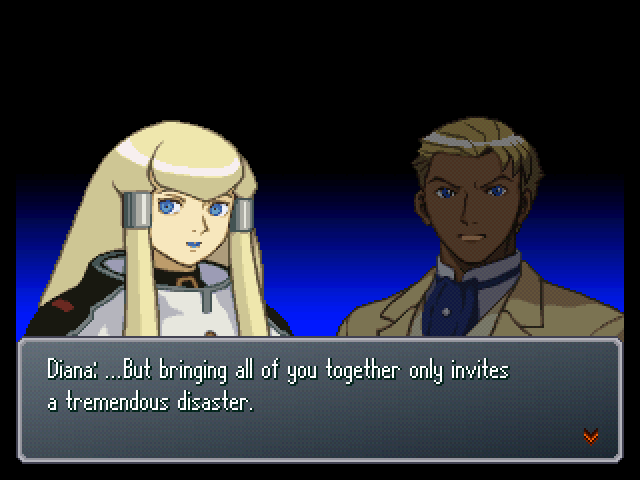 : Even so, I seek to work with all of you to strike down that fate, to build a new history... Perhaps it is also our duty to come forward to the people of Earth. The people of the moon cheer. : The one standing here now is the true Lady Diana. 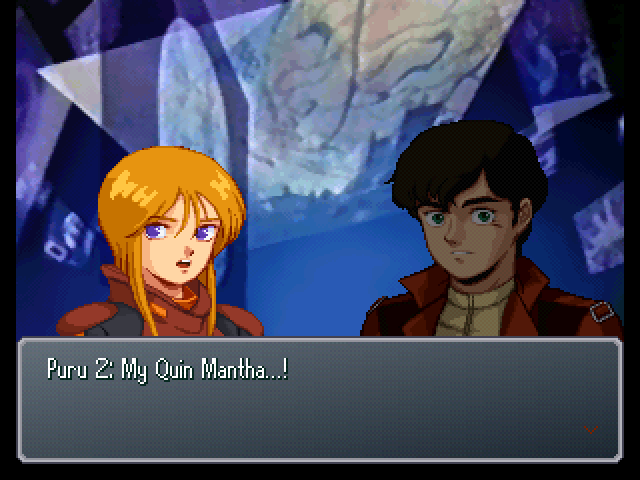 : I take pride in my role as royal guardsman, protecting her... ...Moreso because it allowed me to meet you, Miss Kihel Heim. : This position requires me to protect two women... or even more. : Does that make you happy? : Even with your eyes fixed on Lady Diana...? : ...I know. That is why you don't remove your red sunglasses, right? How base... The Queen knows, too. : ...And work together, moon and Earth, to establish a cultural sphere that will last forever. I have come to believe that a time has come in which we can live and die normally, like the people of old. For that reason, we must borrow upon the Earth's strength. ...And should we not walk together, to avoid ever repeating the mistakes of the past? ...I would also like to ask all of you for your permission. 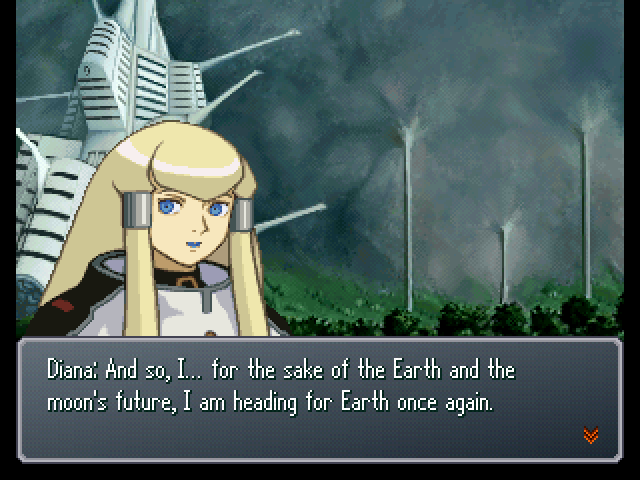 I would like to set out for the Earth once more. 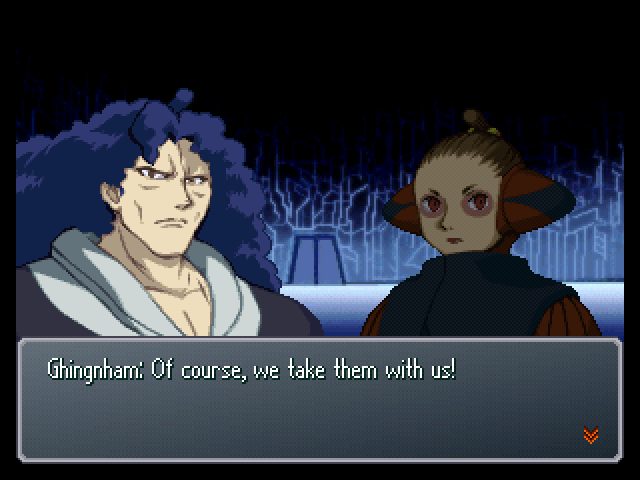 As queen of the Moon Race, I must put a stop to Gym Ghingnham's rampage. 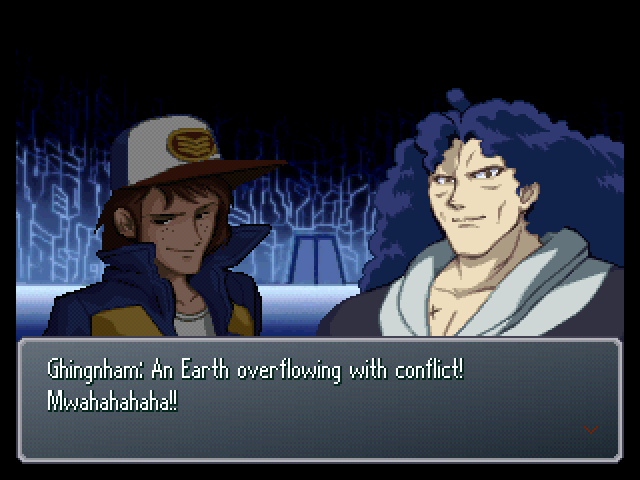 ...If I can do that, then the Earthnoids would surely recognize our right to live upon the Earth.